I rediscovered bacon today. I have not added this bit of heaven into my food in awhile, mostly because I am in the habit of purchasing chicken breast and/or fish at the market. 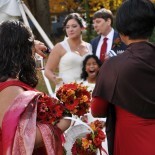 But this week I got a little wild and am oh-so-happy with the choice :). -Preheat oven to 375F. Combine all crust ingredients. 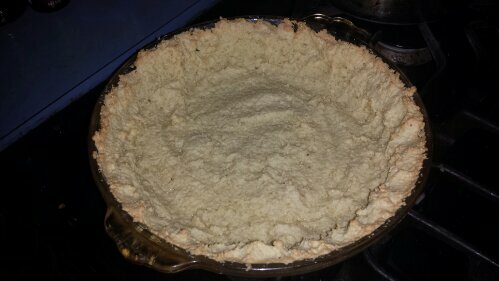 Press “dough” into greased (use coconut oil) pie pan. -Bake crust for 20 min or until golden brown. 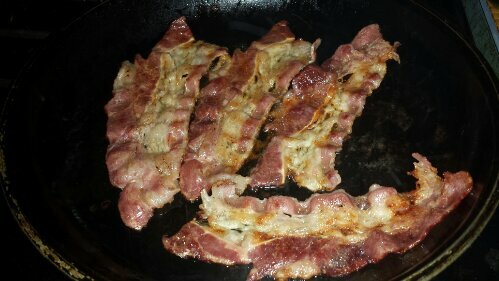 -While crust is baking, Fry bacon, shred and set aside. -Cook onions in bacon fat until translucent. 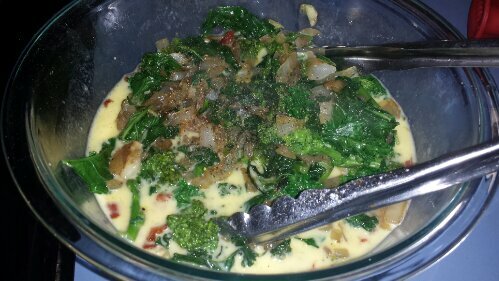 Add kale and broccoli rabe. Cook for 5 min. -Whisk together eggs and coconut milk. Add vegetables. 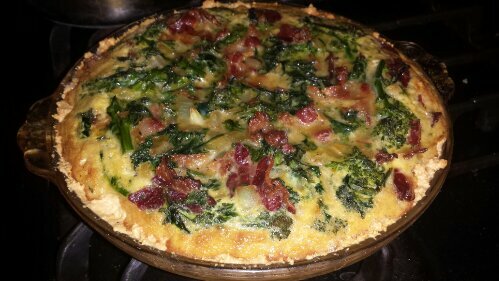 -Pour mixture into crust, bake for 30 min or until center is slightly “jiggly” (not loose!). 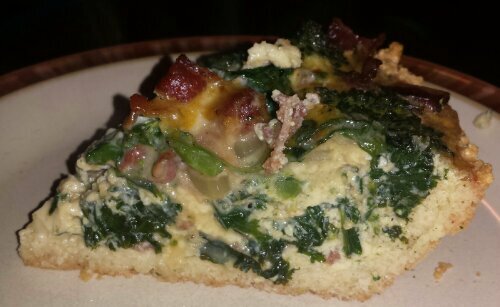 I like my quiche more firm, so I bake until it’s almost solid. Wait 20 min before cutting. Enjoy!! 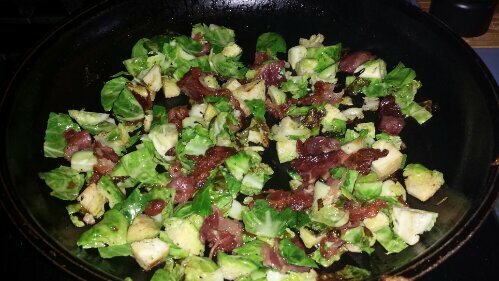 Got a little excited with the bacon, so I also made some brussels & bacon. Yum. 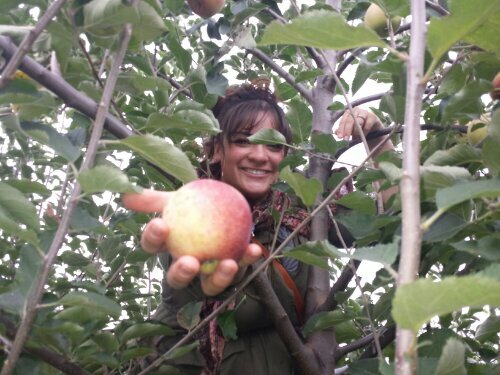 Also went apple picking over the weekend. 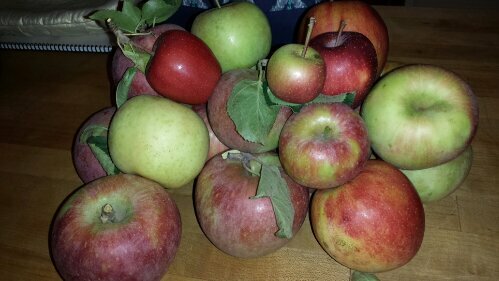 So we had a plethora of apples…enter the apple pie/crisp cravings. 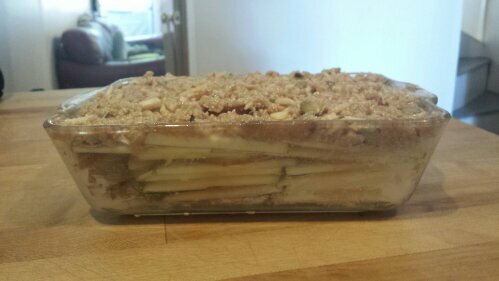 So I made a Paleo apple crisp! 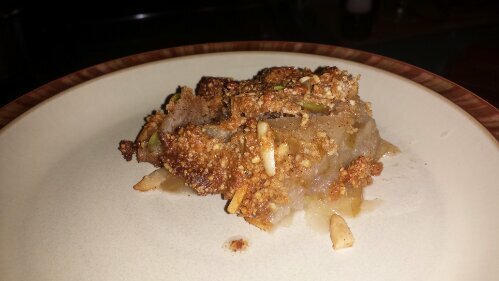 Ingredients: 4 large apples sliced thinly (I like tart/crisp ones like Macintosh), juice of 1 lemon, 1 cup almond flour, 1/2 c dessicated unsweetened coconut, 1/3 cup roasted sunflower seeds, 4 Tbsp coconut oil (melted), 3 Tbsp honey, 1tsp cinnamon, 1/2 tsp nutmeg, pinch of Sea salt. -Preheat oven to 350F. Grease 8×8 or similar sized pan with coconut oil. -Layer apple slices into pan, squeeze lemon juice over top. -Combine dry ingredients thoroughly. Add melted coconut oil and honey. Spread mixture over apples. -Bake for 50 min until topping golden brown. Wait for 10 min before cutting. Eat alone, or with coconut or almond milk! (Also delicious with ice cream if you’re feeling frisky :). Happy Monday, all. Have a wonderful week!! This entry was posted on October 28, 2013 by palexrs in Good eats and tagged good eats, healthy, low carb, paleo, recipe.